You may read this title and chuckle, but it is serious business. Dog/dog greetings are serious business and a lot of information is exchanged in a very short period of time. And dog/people greetings are even more serious and complex as they are inter species greetings. You may be asking why are you making this so serious, April? Why make such a big deal over something that has been going on for centuries? The answer is Play All Day’s mission statement. 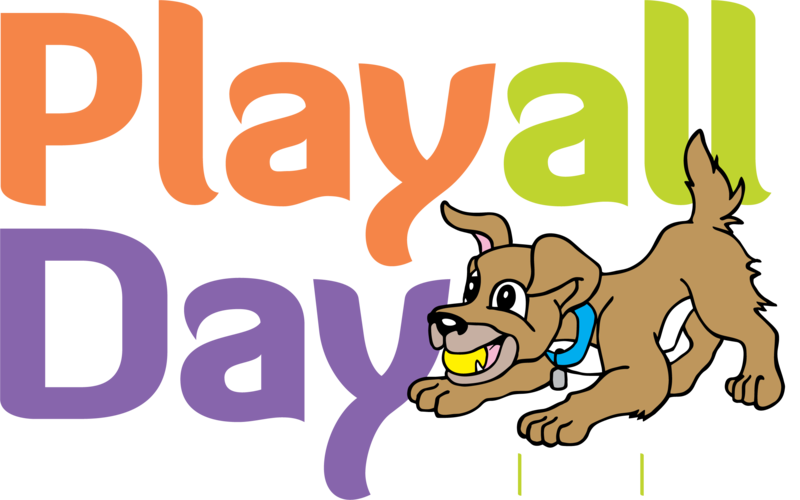 Our mission is to provide a fun, safe, and enriching environment for the dogs in our care. Fulfilling that mission includes educating our dog parents on all things dog whether it be play styles, exercise, nutrition, or dog greetings. 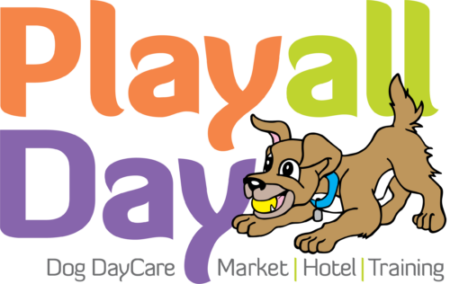 Your dog’s play day with us starts the moment he wakes up on daycare day and starts to read all of the cues that this is the day….this is daycare day. You have all seen it and wonder “how does he know that it’s daycare day?” It continues as you drive to daycare and you turn the corner at Avanti’s and the whining and pacing begin in full force. Hold on tight to the leash when you let him out of the car because he’s all wound up now. And you hope April has put salt on the icy steps as your 70# dog drags you up the steps. And when is April going to get a lighter door….this thing weighs a ton as you struggle to hold on to your very excited kiddo. Uh oh….the reception area is full and one of the dogs is tiny and barking. Etiquette, Shmetiqutte…I’ll be lucky to control him at all! Of course, daycare is an extreme example because it’s like Disney Land to dogs. But you may have similar experiences when you go to the park, the dog park, the vet, PetSmart, a friend’s house, or any other fun place with other dogs. Is it really that important that your dog has good manners when greeting others (dog and human)? The answer is a resounding yes. You may know that your dog is friendly with people and other dogs. But do you know that other dogs are friendly? Do you know that other people are comfortable with strange dogs or big dogs or little dogs? Unless you do, it is always wise and safe to keep your dog under control until it has been established that on leash greetings are appropriate. Do you know that some of my best play group dogs are very leash reactive? Happy and playful as can be in the play rooms, but very uncomfortable and growly when on leash with Mom and Dad. And some dogs get very agitated when meeting dogs through a fence like the one in our reception area. So it’s not always safe to assume that all daycare dogs are dog friendly when on leash, when Mom and Dad are around, and when space is tight. So you may be asking yourself how you are supposed to keep your super excited 7 month old puppy under control in these types of situations. Of course, the first and best answer is training. Training your dog is like putting tools in a toolbox to use when you need them. The second answer is being prepared. Have the right collar or harness on your dog for best control (ask me about this anytime at all). It is life changing to have the right collar/harness on your dog so that you can direct their energy. Being prepared also may include having a toy or super good treat in your pocket to make yourself more interesting than the other dogs. And sometimes the only option is management of the situation. If you get yourself in a tight spot and you can’t control your dog, take yourself and your dog out of the situation temporarily. Getting your dog out and about is great! You are your kiddo’s guardian. It is your responsibility to keep him safe. Build your toolbox so that your outings remain fun and positive. Respect the space of other dogs and people until you establish that greetings are appropriate. When in doubt, go slow. 1. Always bring your dog in on leash. 2. Do not let your dog bolt through the door. Open the door slowly and survey who else is waiting. 3. Have a few food treats to keep your dog’s attention as you wait for them to go back to the play area. 4. Keep your dog on leash as you wait. 5. Avoid letting the dogs interact in the reception area. They are pretty amped up. They will have plenty of time to play together later. 6. If your dog becomes uncontrollable, walk back outside and wait on the ramp for a few minutes until it is less exciting inside. 7. Never hesitate to ask April for advice.